My life is a series of notebooks. I find paper a lot easier to work out ideas on than screens, even though my awful hand writing sometimes makes it difficult to work out what I was trying to get down when I come back to them. Liking notebooks means I have a tendency towards being a stationery fetishist. You start checking various shops for what they do, after a bargain or a new format that might just fit the way you want to work at the moment. 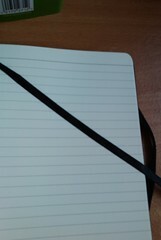 My top brand for notebooks is, of course, Moleskine. I have one of their sketchbook pocket notebooks that lives in my bag in the summer, and my winter coat pocket otherwise. I’ve got a couple of their thin, A5 size notebooks too, but not their standard size hardback ones. I’d like one, but I have a nice WH Smiths covered refillable that I use for client meetings, and a Paperchase A5 notebook I’m using for running notes on various work and personal projects. A Moleskine-looking notebook, but at supermarket prices. Slightly expensive for a supermarket, really, at about £6. I don’t usually go for lined notebooks, but I thought I’d try this one to see what the quality was like. 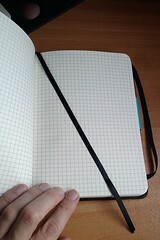 It looks like a Moleskine – black cover, curved corners, elastic to hold it shut and a ribbon bookmark. It even has a concertina pocket inside the back cover. Very Moleskine. Sadly, on closer inspection this is built down to it’s price, as you’d expect. The paper is thin, I can’t write on both sides of a single sheet as the ink shows through the page so much. The cover feels OK but it’s very plasticky compared to a proper Moleskine. Good points – the lines have a well judged margin at the top, allowing for page headings. If you just want a smart looking lined notebook, this is pretty good. I’d call it a rip-off of a Moleskine, unless it’s licensed, in which case it’s just a poor-man’s version. A few weeks after seeing the Sainsbury’s version, I was in my local ASDA and saw they also had a range of smart, black notebooks. Delightfully, they were even cheaper than their competitor and I got an A5 squared notebook for £3. At that price, even if I didn’t like it, I’d happily use it up. I thought they’d be made by the same manufacturer, but the covers are different so I’m not sure that’s the case. The ASDA one is slightly puffier and feels softer to the touch. 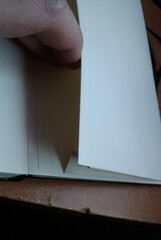 The elastic which holds it shut leaves a noticeable groove in the cover. 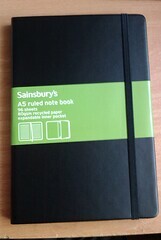 It has all the same items as noted about the Sainsbury’s notebook – back pocket & all. Good points – the paper is thicker and you can barely see the ink when you turn the page over, so you can write on both sides. Bad is that the paper is showing denting or is a little puffed up. I’ve seen this before if thin paper has been left a bit damp. 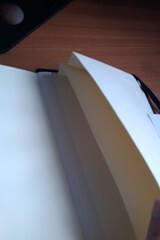 From what I can tell, it’s down to the way they’ve bound the paper so I’m not sure it’s going to be curable. The grid is a bit dark for me, but that might be personal preference. The cover feels like it will take less knocks than the Sainsbury’s one before it’ll start showing damage, but we’ll just have to see about that. 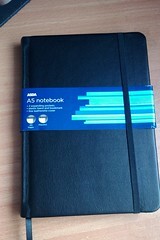 All that said, the thicker paper makes the ASDA notebook one I’m more likely to use more. I’ve got a personal project coming up which will take a chunk of planning, so I think this’ll be the ‘book for that and I’ll see how it goes. Upshot – if you have the cash, go for a Moleskine. They’re lovely to write in and very hard wearing. However, if you’re in the market for a cheapy notebook for your own notes or to look a little flash when you’re in front of a boss or client, pop down to your local supermarket and see what they’ve got. These may be rip-offs of the classic Moleskine, but they’re also pretty usable and it’s hard to fault them at their price. This entry was posted in Notebooks on September 17, 2010 by Paul Silver.